Whatever you do, don’t apologize. We’ve all been there: You’re disoriented, your feet hurt, it’s hot out and your stomach won’t stop interrupting your conversation every few minutes. But Honolulu’s a big city and you have no idea where to go for a decent meal — no, not a decent meal, a good meal. Don’t chance it by walking into the closest restaurant, no matter how cute it looks or how attractive the signage, no matter how inviting (or pushy) the maître d’, because odds are you’ll be disappointed more often than not. Better to let a pro take you by the taste buds and lead you to Hawaii’s best culinary destinations. Whether you prefer a posh three-course dinner complemented with wine or a local off-the-beaten-path favorite, Matthew Gray’s Hawaii Food Tours will please every palate and fill every stomach. Hawaii Food Tours combines the best of tourism with the best of food in an edible experience, shepherding the non-native to some of the town’s leading restaurants. 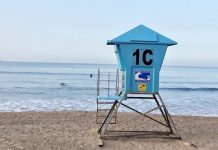 There are three tours to choose from; each will give you a different look at Honolulu with guides as knowledgeable about Hawaii as they are about great food. For me, the best part of the tour (beside the nosh, of course) is undoubtedly Matthew Gray and his partner, Keira Nagai, who together lead each group through the streets of Honolulu. Nagai is a bubbly native Hawaiian who knows the island and its customs inside and out. Her local insights open up the culture in a whole new way. Gray moved to Hawaii in 1993. His background as a professional chef in Los Angeles and personal chef to some of Hollywood’s stars eventually made him one of the islands’ top restaurant reviewers and food critics. As Gray puts it, “I love food,” and in his latest gastronomic venture he’s more than happy to share the love with you, the hungry tourist. Hawaii Food Tours’ cheapest tour — though at US$ 99 it’s a little costly for the budget traveler — is the “Hole-in-the-Wall” tour. The pamphlet promises “several different hidden food gems and exotic ethnic restaurants that contribute to Honolulu’s delicious melting pot” — and that’s exactly what they deliver, in an afternoon of full-portioned feasts. On a recent tour, the first stop was Sugoi Bento and Catering (www.sugoihawaii.com), home of award-winning plate lunches, a traditional Hawaiian meal that usually consists of two scoops of white rice, one scoop of macaroni salad and a meat entrée. Sugoi (Japanese for “wow” or “amazing”) served garlic-chicken bento, a traditional Japanese meal, and, more surprisingly, Spam musubi. Hawaiians, it turns out, eat more Spam (canned meat) per capita than any other state in the Union: more than 4 million cans a year, with each person consuming an average of 12 cans each year. You can even find Spam on the McDonald’s menu in Hawaii, but the fast-food giant isn’t on Gray’s tour. Stick with Sugoi’s Spam musubi: Spam cooked in teriyaki sauce, sandwiched in rice and wrapped in seaweed; it’s similar to a California roll, and as popular with Hawaiian children as peanut butter–and–jelly sandwiches in the Midwest. The next stop was Liliha Bakery, which sells fried-egg sandwiches and amazingly good chocolate éclairs; Liliha Bakery sells more than 5,000 of them every day. Try baked manapua at the Royal Kitchen in Chinatown, Hawaii Food Tours’ next stop. Traditionally, manapua is a steamed roll filled with sweet Chinese roast pork, but the Royal Kitchen offers a number of flavors, including Kalúa pork, curry chicken, sweet potato and Chinese black sugar. Mahapua vendors usually serve their delectable pastries from the back of a truck, much like a nostalgic ice-cream vendor. Zaffron (www.zaffronhawaii.com), one of Hawaii’s finest Indian restaurants, is named after the East Asian spice saffron. Most restaurants shy away from using the world’s most-expensive spice. But not Zaffron; most of their dishes contain generous portions of saffron. Their hot chai tea was a tasty precursor to their excellent lunch buffet. 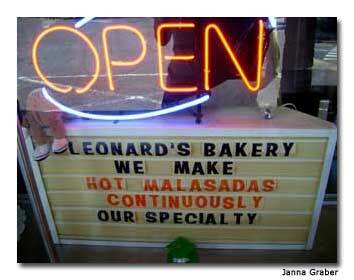 After stopping by It’s Chili in Hawaii, a hot-sauce shop specializing in Hula Girl–brand Chipotle Habanero Hot Sauce, winner of Food Network’s 2004 Fiery Foods Challenge, the “Hole-in-the-Wall” tour finished at Leonard’s (www.leonardshawaii.com), for malasadas, airy fried dough coated with sugar. Hawaii Food Tours also offers a “Hawaiian Feast in Paradise,” a traditional Hawaiian feast in an intimate, casual setting, and the “Gourmet Trilogy Tour for Food & Wine Lovers,” which brings guests to three award-winning restaurants for a three-course meal. All of the tours have complimentary transportation from various Waikiki locations, and air-conditioned buses help hold off the Hawaiian heat. If the “Hole-in-the-Wall” tour can be faulted for anything, it’s not for the food selection, which is exotic enough to please any culinary adventurer, but for the sheer amount of food. Matthew Gray apparently has no problem stuffing his guests; if you’re someone who watches the waistline, just stay at the sushi bar by the hotel. 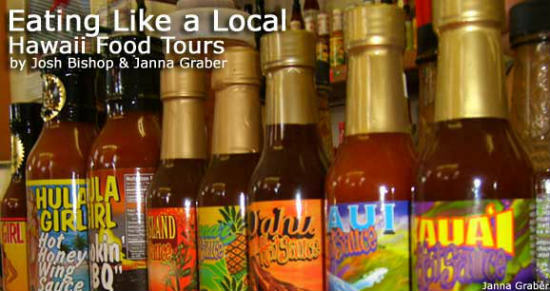 But if you’re game for loosening the belt and sampling some of Hawaii’s best foods, there’s no better way to go than Hawaii Food Tours.